>Counting your eggs before they hatch. 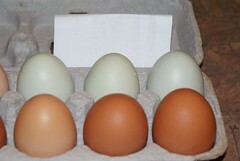 I just FINALLY started getting some pale green eggs last week and have 4 in the fridge right now. The Araucana (not the crooked beaked one of course) finally started laying. I’ve been leaving a 100 watt light on for the chickens the past several nights because it’s so dang cold in there and because of the increased light they have all been laying more. They have all been cooped up for the past four or five days for their own protection because I knew I wouldn’t be home in time to close their coop door and keep them safe and sound. Yesterday I let them out and they went nuts. They were so happy! Unfortunately last night when they went to roost I only counted seven. Sure enough the Araucana (NOT the crooked beaked one which survives against all odds) was missing. I checked the garage shelves where she sometimes tries to roost but nothing. I figured she’d freeze to death during the night because it was one of the coldest nights of the year. This morning, nothing, no sign of her then just a bit ago I went out to refill the thistle seed for the finches and saw a bunch of her feathers strewn about. Looks like she’s fallen prey to whatever is eating the fowl on our farm. The duck is gone too now. We noticed him missing a couple of days ago and hoped he’d show up but no dice.